Settler environmental movements attempting to organize in solidarity with Indigenous peoples have frequently relied on the evocation of eco-feminism and, in doing so, have offered analyses around Indigenous women’s and Two-Spirit peoples’ relationships and responsibilities to land. This has seemed like both an appropriation of similar Indigenous organizing as well as an appropriation of Indigenous spiritualities, cultures, and traditional Indigenous knowledges. Indigenous women and Two-Spirit peoples have long held spiritual, political, and economic relationships with land which are integral to their communities. Indigenous communities, and in particular Indigenous women and Two-Spirit peoples, possess traditional knowledges often referred to by colonial institutions as environmental knowledges or environmental feminisms. However, eco-feminist analyses often fail to address the profound nature of environmental knowledges within Indigenous communities as extending far beyond environmental politics and into the cultural and spiritual lives of Indigenous communities. The connection between land and life has been told through many teachings through a multiplicity of Indigenous communities. 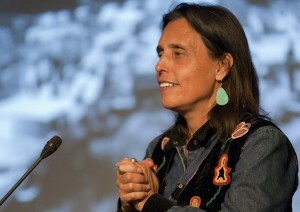 Nookomis Winona LaDuke (1999) reminds us that we have relations outside our human kin and in the environment around us. Indigenous peoples honor these relations in ceremony, song, and in reciprocity with their environments. This is even embodied in our languages. Nehiyaw language and worldview is divided between animate and inanimate. Nehiyaw language is also heavily relational and every work contains meaning about how we relate to other forms in our environment. Certain objects which are not imbued with spirit in the Western worldview are considered animate, or having a consciousness, depending on their relationships with other forms they encounter. 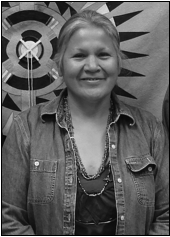 While growing up in northwestern Saskatchewan, Nohkom Maria Campbell learned how the feminine spirit carries with it specific responsibilities to land (Kim, Clow, and Haworth-Brockman 2013, 13). It is women’s and Two-Spirit peoples’ roles within Campbell’s community that facilitate the holding and passing on of environmental knowledge. Campbell describes how grandmothers, as midwives, are responsible for welcoming new life into their community as well as washing and preparing the dead for burial (13). These responsibilities and the ceremonies involved are grounded in the environment—the feminine realm: “younger women have the capacity to hold life-giving waters within, and older women are responsible for helping people move through those waters in times of transition” (13). This teaching tells us about relations between Indigenous peoples, specifically Campbell’s community, and the land. Campbell reminds us that we are comprised of mostly water, just like the earth itself (14). The similarity between our own bodies and the land shows us how everything is connected and how all creation is dependent on reciprocal relationships within these connections. A trend has emerged within the academy to engage such Indigenous knowledges within ecology and environmental studies (Simpson 2004, 373). This practice likely appeals to academics because traditional Indigenous knowledges often promote relationships with the environment that could address ecological disaster and environmental contamination. However, the irony of using traditional Indigenous knowledges to legitimate Western ecological and environmental concepts is far too often ignored. Herein lies the problem of Western environmental frameworks which evoke Indigenous knowledges. While these attempts are often prefaced on the apparent reclamation or preservation of Indigenous knowledges, this practice is both an appropriation of Indigenous worldviews and an erasure of the settler complicity in genocide within these occupied Indigenous territories (375). Indigenous self-determination and the return of stolen Indigenous lands are essential to the reclamation of Indigenous knowledges. Separating Indigenous knowledges from their political contexts only reinforces the denial of Indigenous genocide within these territories on which the settler state legitimates itself (376). It was Eve Tuck and K. Wayne Yang (2012) who reminded us that decolonization is not a metaphor. Similarly, environmental feminism often perpetuates these colonial logics when engaging with Indigenous women’s and Two-Spirit peoples’ relationships to land. When engaging with Indigenous feminism, environmental feminists must first question the problematic history of feminism itself. Many Indigenous feminists have challenged white supremacy and colonialism within mainstream feminism by questioning the colonial logics which pervade feminist discourse. Indigenous feminists seek to unsettle the “feminist unification project” that pervades mainstream feminism by resisting the silencing logics of settler-colonial feminism (Williams and Konsmo 2011, 28-29). How can there be unity between Indigenous feminists and white settler feminists when, by remaining silent on issues of colonialism and white supremacy to serve the so-called sisterhood, it is Indigenous feminists’ own land, communities, sovereignty, and resurgence which is at stake? Indigenous feminists know that mainstream feminism predominantly represents white settler feminists who, more often than not, choose to ignore the ongoing processes of colonialism from which they actually benefit. In fact, it is white women who define normative womanhood in western nations, thereby reinforcing white-supremacist systems of dominance by maintaining racial hierarchies within settler nation states (Moreton-Robinson 2002, 246). The periodization of the feminist movement is just one example of how white settler-colonial feminism operates. By centralizing white middle-class women and locating liberation in the neoliberal acquisition of rights and freedoms, white women propagate white-supremacist logics within feminism (Smith 2011). The historicizing of feminism as beginning and ending with white women erases matrilineal, matriarchal, or egalitarian Indigenous societies which existed in these territories for centuries prior to Indigenous colonization (18). In many traditional Indigenous societies, the division of labor between so-called men’s and women’s roles were non-hierarchical and Indigenous communities were often characterized by a complementary balance throughout genders (18). It was actually the imposition of colonial European gender binaries and hierarchies which brought patriarchy to these territories to begin with (23). Furthermore, by locating feminist histories within legal reform, the history of feminism excludes Indigenous women who belong to their own sovereign nations and have no desire to engage with an illegitimate settler colonial nation state (Simpson 2014). Ecofeminism that appropriates Indigenous environmental knowledges often fails to fully represent what environmental justice means to Indigenous communities. What is often ignored within these analyses is how neocolonial state violence, compounded by exposure to environmental contaminants, is embodied in very specific ways for Indigenous women and Two-Spirit peoples. It’s true that Indigenous communities are disproportionately affected by environmental exposure, as their communities often share close proximity to mining sites, military bases, the release of pesticides, and other sites of environmental contamination (Hoover et al. 2012, 1645). However, Indigenous peoples have again and again described how solutions to the effects of environmental contamination need to extend far beyond the return of land which often streamlines settler solidarity movements. Ultimately, environmental contamination within Indigenous communities directly affects the overall health, culture, and reproductive freedoms of Indigenous communities. This is why Cook created the Akwesasne Mothers’ Milk Project in an effort to better understand how toxic contaminants influence reproductive health within Indigenous communities (19). The project found that women had 200 percent greater concentration of PCBs in their breast milk if they ate fish from the St. Lawrence River, which had been contaminated by GM’s dumping (19). Reproductive justice, in contrast to the mainstream reproductive rights movement, understands an individual’s reproductive life as deeply tied to their communities. 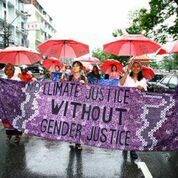 This is why many Indigenous feminists argue that environmental justice is tied to reproductive justice. 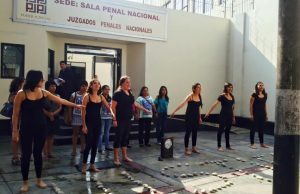 If eco-feminists truly want to engage with Indigenous feminism to legitimize their own movements, they must first engage with their own positionality and privilege as settlers: a positionality on which the continuation of settler-colonialism and the ongoing genocide of Indigenous peoples are prefaced. Furthermore, Indigenous peoples don’t need savior feminists defining what strategies must be used to address environmental contamination within Indigenous communities. Environmental violence has far reaching consequences including those that can be seen in the reproductive lives of Indigenous peoples. What Indigenous feminists want from eco-feminists is simple: Sit down, be quiet, and listen. Anderson, Kim, Barbara Clow, and Margaret Haworth-Brockman. 2013. “Carriers of Water: Aboriginal Women’s Experiences, Relationships, and Reflections.” Journal of Cleaner Production 60 (1): 11-17. Hoover, Elizabeth, Katsi Cook, Ron Plain, Kathy Sanchez, Vi Waghiyi, Pamela Miller, Renee Dufault, Caitlin Sislin, and David O. Carpenter. 2012. “Indigenous Peoples of North America: Environmental Exposures and Reproductive Justice.” Environmental Health Perspectives 120 (12): 1645-1649. LaDuke, Winona. 1999. All Our Relations: Native Struggles for Land and Life. Cambridge: South End Press. Moreton-Robinson, Aileen. 2002. Talkin’ Up to the White Woman: Indigenous Women and Feminism. Brisbane: University of Queensland Press. Simpson, Leanne R. 2004. “Anticolonial Strategies for the Recovery and Maintenance of Indigenous Knowledge.” American Indian Quarterly 18 (3/4): 373-378. Smith, Andrea. 2010. Conquest: Sexual Violence and American Indian Genocide. Brooklyn: South End Press. Smith, Andrea. 2011. “Indigenous feminism without apology.” Unsettling America: Decolonization in Theory & Practice. September 8. Tuck, Eve, and K. Wayne Yang. 2012. “Decolonization is Not a Metaphor.” Decolonization: Indigeneity, Education, and Society 1 (1). Williams, Krysta, and Erin Konsmo. 2011. “Resistance to Indigenous Feminism.” Feminism for Real: Deconstructing the Academic Industrial Complex of Feminism, edited by Jessica Yee. Ottawa: The Canadian Centre for Policy Alternatives. 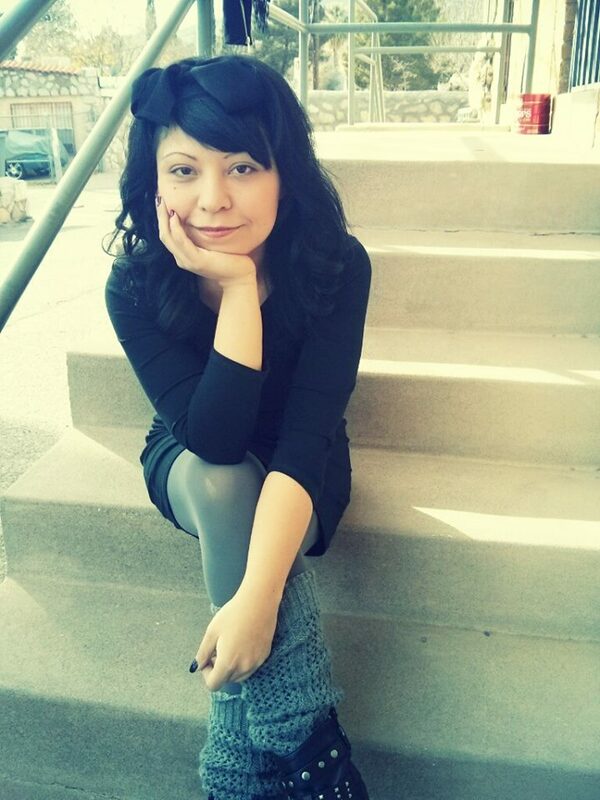 Lindsay Nixon is anishinaabekwe, nêhiyaw-iskwêw from the Tootinaowaziibeeng Nation. She is also the co-founder of the Indigenous women and Two-Spirit Harm Reduction Coalition in Montreal. I would love to know what you think of the Marche Mondiale des Femmes’s theme this year (rough translation to “Free our bodies, our earth, our territories”) and how, from their pt of view, it is coming from a place of collaboration with Indigenous women who are active within the group. Where to draw the line of appropriation? Thank you, Indigenous Feminists! Listening to this: ” eco-feminist analyses often fail to address the profound nature of environmental knowledges within Indigenous communities as extending far beyond environmental politics and into the cultural and spiritual lives of Indigenous communities”, my response is to say yes! – cultural and spiritual connections will further the cause of environmental, cultural and spiritual healing and advancement for all peoples. Women who acknowledge the essential underpinnings of their own indigenous knowledge, even if far removed from the present generation, are becoming leaders. None too soon and still far to go. The roots of unity go far, far back. The Earth has received all the blood of our wombs, offering it back and making of life a forward motion. Having a community that shares this life view empowers Indigenous Feminists. Those of us who recognize we still suffer from our ancestors’ disease of separation long to create such communities. We are learning; teach us as children need to be taught. Thank you.